Arsenic is thought to occur throughout the universe. It is the twentieth most common element in the earth’s crust, having a concentration of 1.8 ppm. Arsenic is thought to occur throughout the universe. It is the twentieth most common element in the earth’s crust, having a concentration of 1.8 ppm. Arsenic is today the commonest source of acute heavy metal poisoning, and is second only to lead in the incidence of chronic toxicity. · Arsenic is a metalloid i.e. it is an element which resembles a metal in some respects, and is by itself not very toxic. · However, almost all the salts are toxic to varying degree. Arsenic is a silver-grey or tin-white, shiny, brittle, crystal- line and metallic-looking element (Fig 9.1). It is rarely found in its isolated, elemental form. More commonly, it is present in mineral species, in alloys, or as an oxide or other compound form. · Table 9.1 displays the physical properties and uses of arsenic and its compounds. · 200 to 300 mg for arsenic trioxide. · In general, the pentavalent form of arsenic (arsenate) is less toxic than the trivalent form (arsenite) because it is less water soluble. · The most toxic form is arsine gas (25 to 30 ppm can be lethal in 30 minutes). · Arsenic is absorbed through all portals of entry including oral, inhalational, and cutaneous routes. · After absorption it is redistributed to the liver, lungs, intestinal wall, and spleen, where it binds to the sulfydryl groups of tissue proteins. Arsenic replaces phosphorus in the bone where it may remain for years. It gets deposited also in hair. · While arsenic does not cross the blood-brain barrier easily, it crosses the placenta readily and can give rise to intrauterine death of the foetus. In less severe intoxications it can cause respiratory distress of the newborn due to pulmonary haemorrhage and hyaline membrane formation. · Mentioned in Table 9.2. · Dermal pigmentation is consistently seen in chronic arsenic poisoning, and may also be encountered in exposure to certain other substances, (Table 9.3). · In West Bengal, thousands of people residing in more than villages are known to consume arsenic-contaminated groundwater, and many of them have arsenical skin lesions. Conjunctivitis, depigmented lesions, melanosis, and hyper-keratosis (Fig 9.2), are most commony present, but malignant neoplasms and gangrenous lesions have also been found. Pulmonary lesions are also fairly common. · Urine level: If the 24 hour excretion of arsenic exceeds100 mcg, it is indicative of toxicity. However, ingestion of seafood can interfere with interpretation since consid-erable concentrations of organic arsenicals such as arse-nobetaine and arsenocholine may be present in shellfish,cod, haddock, etc., although it is not associated with toxic effects. In such cases, the analysis must be repeated after 2 days of “no fish” diet. · Blood level: This is less reliable than urine level becauseof short half-life of arsenic in the blood. However, a blood level of arsenic less than 7 mcg/100 mL (70 mcg/L) is generally considered in the normal range. · Hair level: Although considered to be an important diag-nostic criterion, it is actually virtually useless since it cannot discriminate between external deposition and toxic accumulation. If hair is sent for arsenic quantitation, pubic hair instead of scalp hair should be sent because of the possibility of scalp hair being contaminated with arsenic from the environment. · Radiography: Since arsenic is radiopaque, abdominal x-ray may reveal its presence in the gastrointestinal tract in acute poisoning. Table 9.4 presents a list of radiopaque poisons commonly encountered in practice. Monitor CBC, serum electrolytes, urinalysis (for proteinuria, haematuria or pyuria), liver and renal func- tion tests. Obtain an ECG and institute continuous cardiac monitoring in symptomatic patients. Obtain a chest radiograph in patients with severe poisoning or pulmonary effects. Initial and periodic biological monitoring and medical surveillance are required for employees exposed to arsenic. · Supportive measures: gastric lavage, intravenous fluids, cardiac monitoring, etc. · Chelation therapy: This can be done with BAL (BritishAnti Lewisite or dimercaprol), penicillamine, DMSA (Dimercapto succinic acid), or DMPS (Dimercapto propane sulfonic acid). · The usual agent employed is BAL at a dose of 3 to 5 mg/kg intramuscularly every 4 hours until the urinary arsenic excretion dips below 50 mcg/24 hours. Usual duration of therapy is 7 to 10 days. · In patients who are not allergic to penicillin, penicil-lamine can be given orally at a dose of 100 mg/kg/day, 6th hourly for 5 days. · DMSA and DMPS said to be superior to BAL and penicillamine, are currently not available in India. · Begin chelation therapy in symptomatic patients. The urine arsenic level which should prompt chela-tion in an asymptomatic patient has been recom-mended as 200 mcg/litre. · Repeat courses of chelation therapy should be prescribed in severe poisonings until the 24-hour urine arsenic level falls below 50 mcg/litre. Observation for return of symptoms is strongly recommended. · Chelation therapy is not very effective for chronic poisoning, and is totally ineffective in arsine poisoning. The latter should be treated with emphasis on respiratory stabilisation and haemo-dialysis. · Gastrointestinal congestion is a noteworthy feature in acute arsenic poisoning and varies from a mere reddening of mucosa (red velvet) to frank haemorrhagic gastritis. Focal haemorrhages giving rise to a flea bitten appearance is said to be characteristic. The intestines may be inflamed and may contain “rice water” contents. · Subendocardial haemorrhages are often seen in the heart. · There may be evidence of fatty degeneration of heart, liver, and kidneys. · Chronic arsenic poisoning may present features of non-specific gastrointestinal inflammation, as well as renal and hepatic damage, at autopsy. · It is conventional to preserve apart from the routine viscera and body fluids, a piece of long bone (preferably femur), a bunch of pulled scalp hair, a wedge of muscle, and a small portion of skin (from the back of the trunk) for chemical analysis. ■■ Arsenic has had an outstanding reputation as an ideal homicidal poison especially in the West, particularly United Kingdom in the Victorian era. Several celebrated murders are said to have been accomplished with the help of arsenic during this period. One of the most shocking cases which remained speculative until recently, when scientific evidence finally established the truth beyond reasonable doubt, was that of Napoleon Bonaparte. ■■ Arsenic trioxide being almost tasteless and colourless in solution can be administered without arousing the suspicion of a victim. The main obstacle is relative insolubility. But the solubility can be greatly enhanced if hot solutions are used such as coffee, tea, cocoa, porridge or gruel, and soups. The only problem is that on cooling, much of the dissolved arsenic will separate out to yield a gritty deposit. On chronic successful administration to a victim, arsenic produces insidious but relentlessly progressive symptoms which are likely to be mistaken even by a medical practitioner for natural causes such as neurological disease, alcoholism, tuberculosis, and hepatic or renal afflictions, while acute poisoning may be confused with gastroenteritis or cholera. ■■ However the popularity of arsenic has declined in recent times because of various factors, and today most cases of arsenic poisoning are accidental, though murders are still reported from time to time. Accidental poisoning may be the result of industrial or occupational exposure, or it may be due to consumption of contaminated water or food. · In the past, certain allopathic drugs used to contain arsenic and iatrogenic poisoning was not uncommon. Today ayurvedic preparations constitute the main hazard, some of which can contain substantial concen-trations of arsenic that can produce chronic poisoning on prolonged use. · One of the most important sources of chronic acci-dental poisoning in India is consumption of well water. There are indications that sizeable populations of several Asian countries are exposed to arsenic tainted water, particularly tube well water. A devastating health crisis (endemic hydroarsenicism) began to unfold in West Bengal in the early 1980s due to exposure to arsenic laced well water. 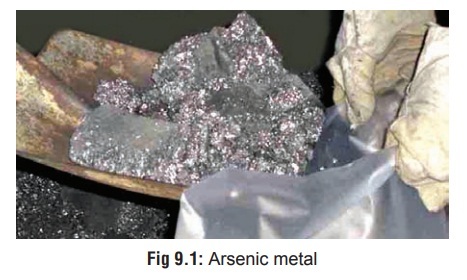 High levels of arsenic have been demonstrated which probably leached from natural underground sources into thousands of village wells affecting more than 250,000 people who display overt manifestations (especially related to the skin) such as hyperkeratosis, pigmentation, and skin cancer (Fig 9.5), while more than 1 million who are continuing to drink the tainted water may develop lesions over a period of time. While the exact cause for this wide-spread contamination of water could not be pinpointed, it is believed that the problem is related to the large scale withdrawal of ground water. Whatever the under-lying mechanism, the fact remains that analysis of water from more than 200,000 tube wells demonstrated arsenic content above the WHO permissible limit of 0.01 mg/L in more than 60% samples (some as high as 3.7 mg/L). Hair, urine, skin, and nail samples from people drinking the water have also been shown to contain high levels of arsenic. In order to counter this tragedy, the West Bengal government is in the process of arranging the supply of arsenic-free piped water from the Ganges river, but the full implementation of such a programme may take several years, and involve the expenditure of millions of dollars of foreign aid. The most alarming question raised by this tragedy is how many tens of millions of people may be exposed to high levels of arsenic in areas not yet tested for contamination elsewhere in India.